#PositiveSWBrum – Who is the Postman behind the mask raising all the loot?! A local ‘Postie’ – who once a year dons a fancy dress costume to deliver his mail on his Spiceland Road estate round in Northfield – has raised more than £6000 over the last ten years. Three year old Clay collects post from Batman! The West Heath Caped Crusader, also known as Dave O’Neill, has been a postman for 39 years – and raising much needed funds for the Alzheimer’s charity for the past 10 years after his mother sadly passed away. During this time, the Dad of two and grandad of a three-year-old, has dressed up as several characters, including Superman, Scooby Doo, Robin Hood, a Gorilla, Pink Panther and a Beer Bottle to name a few. 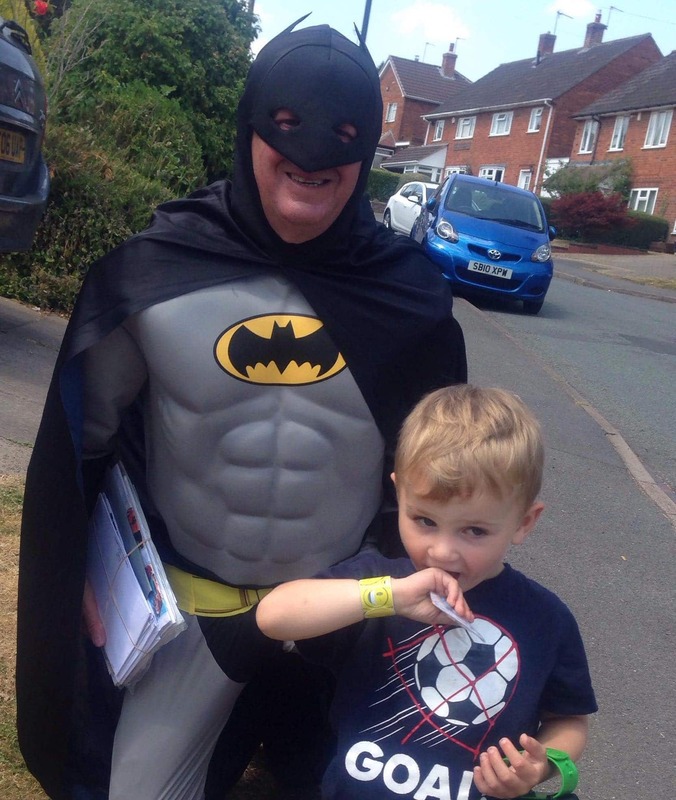 It was no easy task delivering mail dressed as the DC Comic character, especially in the sweltering heat – fortunately this fundraising funster was not wearing his ‘special super thermal b long underwear’! Not only has he been raising money for a wonderfully important charity, he has brought a lot of fun and he’s “lifting spirits of the community, and most of all the children, delivering our post as batman!” said B31 Voices reader, Laura. Julie Fenton from Birmingham and Solihull Fundraising Group for the Alzheimer’s Society said: “Each year his collection raises more – last year it was almost £800. This goes to show how many people want to support a charity which affects so many. If you would like to donate but missed Batman, you can donate online and find out more information about Alzheimers Society, please visit here.